The worst of the worst — when a little snow shut down the city. OK, it’s usually not this bad, right? But still… Sometimes it felt like it. Now I work on North Avenue, the same street where I live less than 3 miles away. It’s so close that I’m home in 10 minutes. I can even scoot home for lunch, which I do sometimes, feeling as free as a kid in school. It’s so close I could ride my bike – and I will someday, just as soon as I get comfortable with the new dangers traffic poses to bicycle commuters. It’s so close I could even walk, if it’s not too hot out and I don’t mind arriving a little sweaty. With work so close to home, I now have everything I need nearby – not only my job, but shops, restaurants, a dry cleaner, a gym, bike trails, a Publix and a movie theater. My own Mayberry in the big city. And I never have to look at this. Just the daily gift of two hours back into my life is a tremendous blessing. I can’t tell you how good it simply feels to be without the psychological and, yes, physical stress of being stuck on Ga. 400 or I-85 – knowing there’s absolutely nothing you can do about it. I can snooze a little later in the mornings and I can make – and keep – appointments in the evening. I can go to the gym or see a friend for dinner or a movie. I can even – shhhh! – take a little catnap after the workday. I’m saving money on gas and wear-and-tear on my car. My blood pressure is closer to where it should be. And when I see friends complaining about the schlep home from the Perimeter on Facebook or Twitter, I say a little prayer of gratitude — and I am not even kidding. 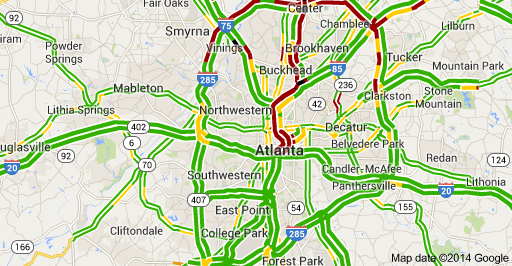 Traffic in metro Atlanta is hell, right? But it’s nothing at all in my little world. This entry was posted in Atlanta, Social Media and tagged atlanta, North Avenue, snowjam, traffic on September 17, 2014 by Jay Croft. Long before last week’s SnowJam made it national news, everyone in metro Atlanta knew what a drag the morning and evening rush hours are. Some people carpool or take MARTA to make things better. Josh Woiderski started theruncommuter.com blog to share his enthusiasm for the healthy alternative to getting stuck in traffic (long before SnowJam). That’s right. He runs to work and back most days rather than drive. He’s not alone. And he’s telling a story that’s drawing readers, participants and even sponsors on his blog, theruncommuter.com. Woiderski, 37, is a paralegal downtown and longtime long-distance runner. He started running to work a few years ago after a wreck totaled his car. Rather than buy a new one right away, he started jogging from his then-home in West End. A married father of two boys and now living near Decatur, Woiderski runs into Atlanta most days, more than 5 miles each way. He ran last Tuesday, when 2 inches of snow shut down transit across metro Atlanta, then took a slow-moving MARTA train most of the way home before giving up and going on foot the rest of the way. 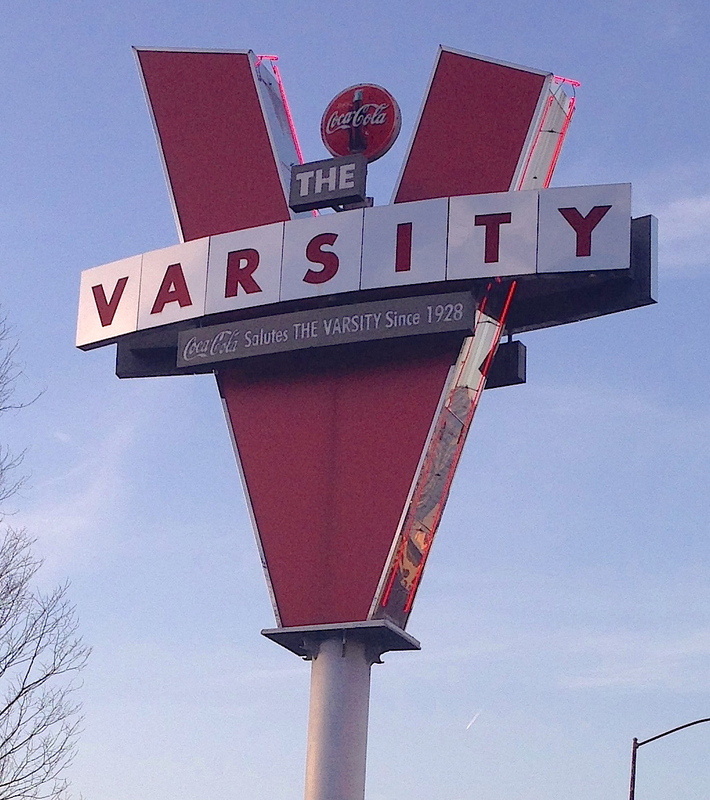 I run on the sidewalks of Dekalb Avenue all the way into downtown Atlanta. There are days when I’ll change my route, especially when I’m meeting friends after work in Poncey-Highland or Little Five Points. On those days, I may use the PATH or the BeltLine for part of my trip. DO YOU SHOWER AT THE OFFICE? I don’t shower at the office (mainly because we don’t have one). The “no shower” method consists of taking a shower at home before leaving in the morning, cooling down in front of a fan in your office after you arrive, using baby wipes to clean your head and body, dressing, and then washing your face and head in the bathroom. It’s worked just fine for the last five years. And I work in a business environment where I regularly attend meetings and court hearings. I wrote my first post about run commuting in February 2010. A few months later I was looking at our website stats and noticed many people were searching the web for things related to run commuting (running backpacks, running to work, etc.) and it was directing them to our blog. I searched the Internet and realized there were no good resources on run commuting, so I created The Run Commuter to fill that void. At first, I was happy to get 30 or 40 hits a day. And then something cool happened. Other run commuters from around the world starting contacting us. We asked them to write about their commutes and soon we had a handful of contributors from the United States and Canada. Now we have a site that receives hundreds of hits a day and is the go-to destination for run commuter information, gear and tips. Manufacturers send me gear to review, and I even receive a small percentage from some online sales. It’s not making me rich, but it is a nice, unexpected benefit of sharing the story of something I love so much. 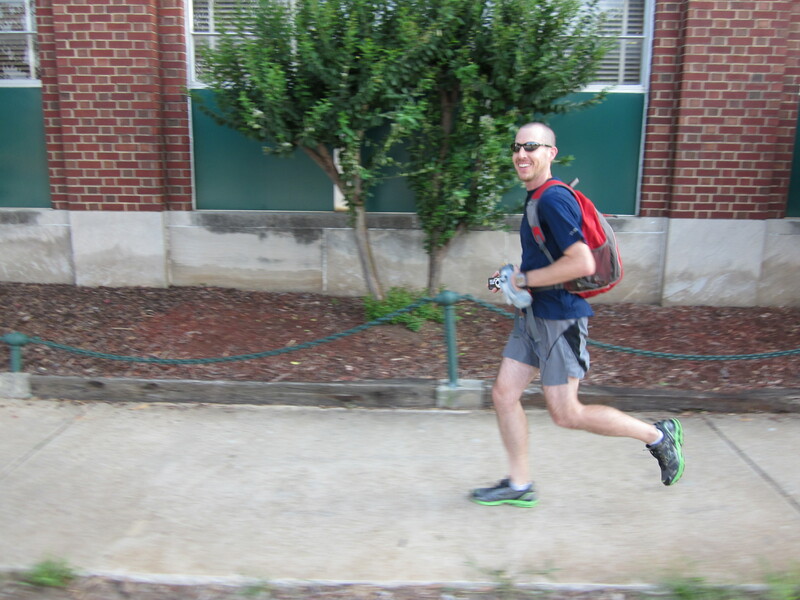 It’s awesome when someone visits the site and it inspires them to start run commuting. And one of the most encouraging things to see is a coworker or friend who is run commuting already. So we hope that by sharing the experiences of new run commuters, along with helpful tips and guidance for those considering giving it a shot, that we’ll see run commuting grow exponentially around the world. Soon after we created The Run Commuter, additional sites sprang up in other countries. These include Running to Work (UK), Running to Work (Spain), and Run Commuter (Netherlands). We loosely cooperate on a few projects, such as a yearly Run to Work Day and share experiences via @TheRunCommuter on Twitter and videos on YouTube. This entry was posted in Atlanta, Social Media and tagged commute, decatur, run, run commute, snowjam, traffic on February 3, 2014 by Jay Croft. How do you tell a weather story? In countless ways this week, via publications, social media, video and more. And this was about much more than the weather, of course. There have been countless examples of great storytelling on SnowJam in metro Atlanta. Here are some I liked. 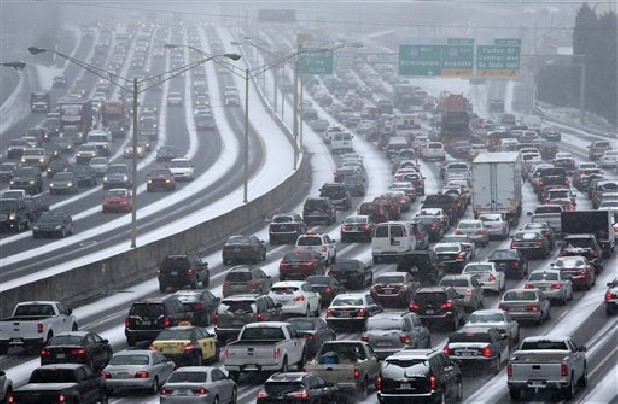 Metro Atlanta in chaos: A great shot from David Tulis/AP on the AJC. 1. The Day We Lost Atlanta: How 2 lousy inches of snow paralyzed a metro area of 6 million. Great article, great headline — including that use of “area.” This disaster affected the entire region and can’t be blamed on the city alone. 2. There are tons of great photos on social media and news sites. Here is one of the many roundups of shots taken while the mess was unfolding. 3. Here’s another of aerial shots from the AJC. 4. In a region full of epic nightmares… Here’s one (of many, I know) that’s just… just… wow. An AJC reporter shares her amazing story: The long way home: a reporter’s night on I-75. 5. CBS News video on the baby born amid the mayhem. 7. The New York Times gives a nice roundup of examples of how Atlantans used social media. It’s by no means definitive — nor could it be, given the huge role Twitter, Facebook and more played in connecting people and sharing vital information and support. 8. From The Atlantic: How 2 Inches of Snow Created a Traffic Nightmare. 9. 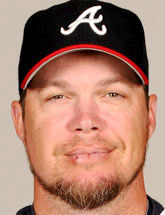 Chipper to the rescue: a story in tweets. 10. From a staight-talking writer in Birmingham, Ala.: Why the South Fell Apart in the Snow. 11. CNN looks ahead: What other cities can learn from Atlanta’s ice debacle. 12. Finally, view this stunning shot of Peachtree Street outside The Fox, from photographer Christina Alman. From all the chaos, a scene of the city at its most beautiful. This entry was posted in Atlanta, Business Comms, Social Media and tagged 2 inches of snow, Chattanooga, jan 28, metro atlanta, nightmare, snow, snowjam, traffic on January 31, 2014 by Jay Croft. 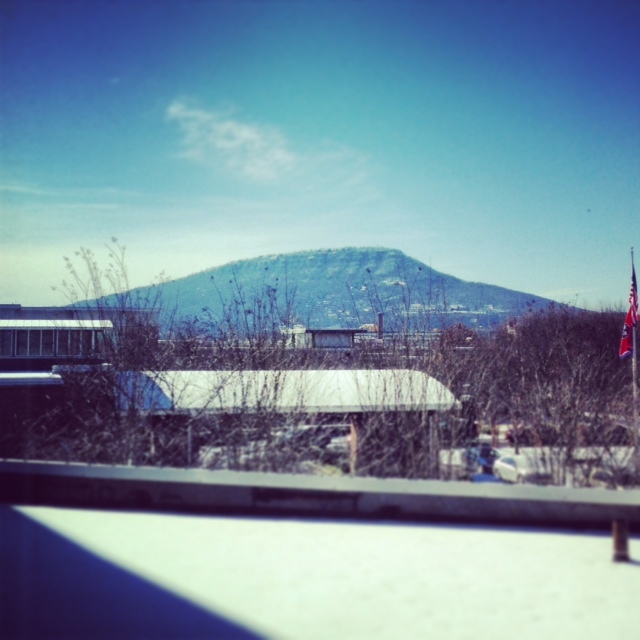 Lookout Mountain never looked so good to me as it did yesterday from my room in the Chattanoogan. I made it home to Atlanta this afternoon, after a second night in a hotel. I can’t complain — the Chattanoogan Hotel was more than accommodating (and I’m looking forward to a return visit sometime). And the drive home today was mostly free of hassle. I am not getting in my car until tomorrow, at least. I got to hear Gov. Deal’s doozy of a press conference on the drive. I’m looking forward to reading some of the articles about this week’s mess, and I’ll accumulate a list of some of the best. Some great social media examples, along with good analyses of what happened and why — and what can be done to prevent it from happening again. Plus some fun stuff with photos and videos and a certain future Major League Baseball Hall of Famer. This entry was posted in Atlanta, Social Media and tagged ATLSnow, Chattanooga, Gov. Nathan Deal, jan 28, metro atlanta, nightmare, snowjam, traffic on January 30, 2014 by Jay Croft. The mess brought out the best in folks, though, with people offering shelter, food and other support last night. Did you see this heartening group on Facebook? Lots of great examples out there. And everyone I encountered on my journey was helpful and kind, with a “we’re in it together, but what can you do” approach. SnowJam Day 2 finds me in a hotel in sunny downtown Chattanooga, with WiFi and a restaurant downstairs and a charming city out the door. Friends and news updates made it clear I should wait another day before trying to break through again. This entry was posted in Atlanta, Social Media and tagged jan 28, metro atlanta, nightmare, snow, snowjam, traffic on January 29, 2014 by Jay Croft. I am spending tonight in a Rodeway Inn near Calhoun, Ga., and thankful for it. I left Nashville after lunch. It’s usually a four-hour drive home to Atlanta, and I was expecting some extra traffic because of the weather. But really — who could have predicted that a little snow would shut down our city? I never made it closer to home than the Acworth exit, where traffic came to a stop and I finally decided to get a room for the night rather than keep fighting the slow-moving traffic, snowy roads and patches of ice on I-75. But since all the hotels near Acworth were booked, a kindly clerk and a friend on the phone helped me find the closest available room — 40 miles back north toward Chattanooga. For dinner, I was warned that the Hardee’s and maybe the Wendy’s near this hotel were closed because of the weather, so I hit a McDonald’s drive-thru. I finally checked in here about 10 p.m.
Thankful, yes, to be off the road and in a warm room. That’s just my little story of a ridiculously messy day. Add it to the millions of others. What a mess. This entry was posted in Atlanta and tagged hotel, I-75, jan 28, metro atlanta, nightmare, snow, snowjam, traffic on January 28, 2014 by Jay Croft.